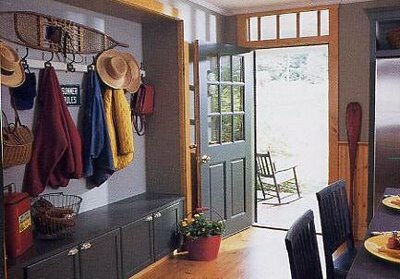 Don't underestimate the importance of an organized everyday entrance to your home. This entrance should be neat and functional, making you feel good when you come home. Give coats, keys, mail, shoes, boots and winter-wear items their own place. Coats may be hung on simple hooks with an over-shelf providing storage for smaller items. A coat tree can be an alternative to wall hooks and also provide an interesting vertical element. Attractive baskets on a small table will hold your keys and mail. While removing your coat, a bench is an ideal place to put the grocery bags, purse or briefcase and provides seating while removing boots which can then be stored underneath. In the above home renovation, we devoted a very small amount of space in the kitchen for coats and everyday stuff. We found interesting hooks and built-in the bench with storage beneath it. It is an attractive feature of the room and keeps the stuff contained. Make it easy for your family to keep everyday stuff contained and organized.